Okay, you’re sold on this whole “no-knead bread” thing. You’re ready to try it out. Problem is, you’re never in one spot long enough to make it through the whole twenty-odd hour process. Or maybe you just want a homemade loaf of bread, but can’t be bothered to channel your inner Martha Stewart to get it. Either way, what you need is no-knead bread, made fast. Lucky for you, there’s an easy way to speed the process up: add more yeast. 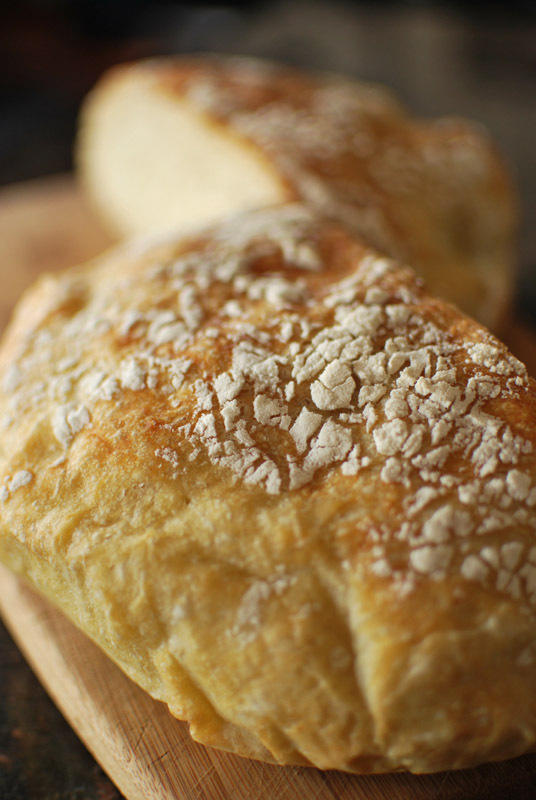 The genius behind the original no-knead bread is the tiny bit of yeast used. 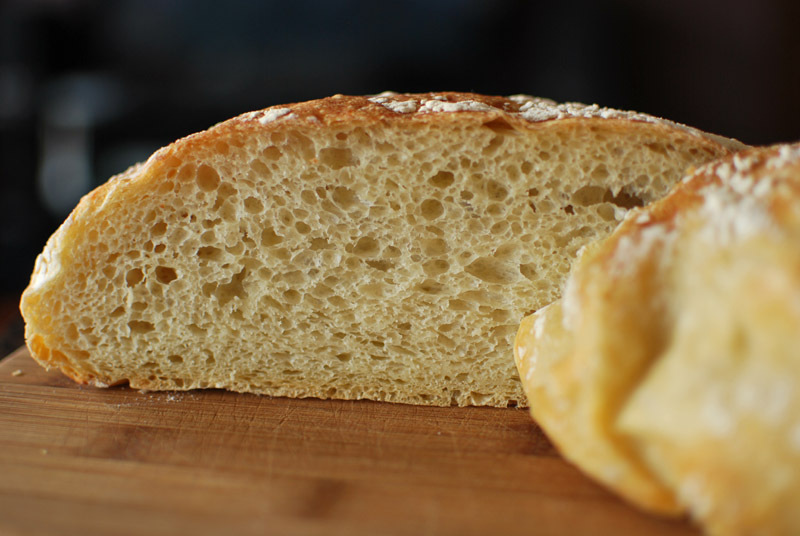 This little amount will leaven the bread, eventually – yeast will continue to grow and multiply forever, as long as the food supply and living conditions remain available and stable – but with no-knead bread, it takes the yeast so long to do that, it gives the dough ample opportunity to form a proper gluten network. If you were to form the gluten by kneading instead, it would be highly over-developed by the time that little bit of yeast grew enough to actually leaven the dough. But wait, you may ask, if we just add more yeast to no-knead bread, how does the gluten have enough time to form properly? Well, unless you knead the dough, it won’t. And since kneading would defeat the titular purpose of no-knead bread, I think that’s unacceptable. So how do we get more gluten? Enter Vital Wheat Gluten, a substance that looks an awful lot like regular flour, but less powdery. The name is actually a misnomer, since it’s not really gluten. It’s simply wheat flour with most of the starch washed out, leaving mostly protein. It’s these proteins that, when mixed with water, form gluten. (For contrast, vital wheat gluten contains around 70% to 80% protein, compared to 10% to 12% in all-purpose flour). Adding a bit of vital wheat gluten to no-knead dough makes for more gluten in less time, which means we can use less yeast. Problem solved, right? Almost. Another issue with making bread quickly is that you generally lose flavor, as the enzymes and acids that make for the highly complex taste of great bread need time to develop. So if we’re losing some of that flavor, we can turn to the old wives’ trick of adding a touch of white vinegar to the dough, which mimics the acidic taste of a long-rising sourdough. I’m not joking; it really works. It’s not perfect, but it certainly goes a long way towards helping the flavor of an otherwise lackluster dough. So how does this fast no-knead bread turn out? Impressively, is how. It only took about 3 hours to rise the first time, as compared to 18 to 20 for the original no-knead bread. I gave it about an hour for the second rise, not far off from the original recipe; by that time, the yeast was so active that the dough more than doubled in size. This made for a very tall loaf, with plenty of open holes in the crumb. The crust was comparable to the original recipe, that is, slightly thick, but pleasantly so, and not rock-hard. The flavor, though, surprised me the most; I think it was much improved over the original. It tasted creamy and complex, belying the speed and ease with which it was made. I prefer this to the original no-knead bread on many levels: it’s faster, it tastes better, and it has a better texture inside. What more could you want? 1. In a large bowl, whisk together the flour, vital wheat gluten, yeast, and salt. Add the water and vinegar, and stir until blended; the dough will be shaggy and sticky. Cover tightly with plastic wrap, and let dough sit at room temperature for 3 to 4 hours, or until very risen and bubbly. 2. Line a 10 inch skillet or any wide, shallow bowl with a large square of parchment paper. Turn the dough out onto a well-floured work surface; sprinkle it with a little more flour and fold it over on itself a few times, until it forms a roughly round shape. A bench scraper helps greatly with this step. 3. Transfer the dough to the parchment-lined skillet, and dust heavily with wheat bran or additional flour. Cover loosely with plastic wrap and let rise until doubled in size, about 1 to 1½ hours. When it is ready, the dough will not readily spring back when poked gently with a fingertip. 2. Vital wheat gluten may be found at some natural or health food grocery stores (such as Whole Foods), specialty baking shops, or online at King Arthur Flour or Amazon. I used Bob’s Red Mill brand.